Studio Japan & PlayStation brings us another adventure featuring the lovable relic hero in the Knack series. Created by the very talented team over at studio Japan and directed by Mark Cerny. 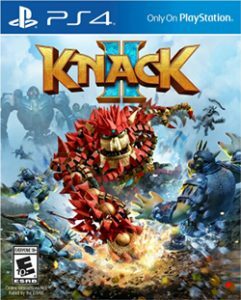 Is Knack 2 a proper sequel, or should it have just remained a one hit wonder? Let us find out. Story: In Knack’s all new adventure, we see the same heroes from the first game (Lucas, Ryder, Charlotte & Dr. Vargas.) In the beginning, the heroes uncover a statue of Harion, a hero who defeated the goblins and titans during the crystal wars. We find out that the high goblins and titans are coming back to life to destroy the human race. During our adventure, we make new friends and enemies, like Ava and Xander who have a monastery full of monks trained to fight against the goblins and titans. Gameplay: Knack 2 is a platformer beatem up; through each level, you will punch, kick & jump. However, as you defeat enemies you can unlock new moves and powers. A lot has been added to the game play, which is nice, but is it enough? Let me start by talking about the added moves like the kick and the hook shot. These moves add a nice variety when it comes to the combat but once you figure out how to defeat a certain enemy you end up using that move repeatedly. Puzzles have also been added in Knack 2 while only a few are tricky, the majority of them can be figured out within a minute or two but they are a nice addition. My thoughts: Knack 2 is what the first game should have been in the first place, with number two actually having platforming in it. I felt the combat became repetitive by the 12th chapter, I felt the characters were quite bland except for Lucas, Ava and Xander. However, I love what has been put into this game compared to the first one. The story is just long enough to keep me interested and is nowhere near as challenging as the first game, which is a good thing giving all the types of enemies.